We’ve got to hand it to the White House. Their leadership style is a total joke/circus, but they’re never dull. In the related articles which always start off with the Russian scandal updates, beyond that we see the newsfeeds dominated this past week with more evidence of Trump obstruction from his shenanigans surrounding Jeff Sessions, plus all the fallout from the Fire & Fury book by Michael Wolff. I shifted over to part 2 the other headlines on Bannon’s fall, & also the GOP trying to deflect guilt over to the author of the dossier & Hillary yet again. And my rants have gotten longer as the news seems to be getting crazier. So in another wildly outrageous week, all the many details go beyond my ability to articulate, so I invite you to peruse the link titles & pick out the ones you find most interesting. Also feel free to forward the most relevant/impactful news updates to others who like following this chaotic political environment, or more conveniently just invite them to visit the blog site The Voracs. To illustrate how much of a wanna-be fascist dictator Trump aspires to be, rather the respecting the vital independent nature of agencies like the DOJ & FBI, Trump tries to demand of them to become his attack dogs in going after political enemies. When Trump complained where’s my Roy Cohn?, that reveals an awful lot. Cohn was the type of conniving, unscrupulous, unrelenting hatchet man Trump envisioned of Sessions & Comey in being compliant puppets doing his dirty work. Back in the day Cohn served as aggressive sidekicks to none other than Joseph McCarthy & Donald Trump. Our prez incorrectly assumes & demands total loyalty from department heads like Sessions & Comey, much like he got from Cohn back in the 1980’s, which failing to gain such servitude results in Trump lashing out with verbal attacks, while seeking to find grounds to fire them. There is corruption & obstruction of justice running all throughout these latest revelations about Trump’s demands/influence from earlier in 2017. Trump had ordered White House lawyer Don McGahn (who presumably works on behalf of the American people) & others among his White House staff to persuade Jeff Sessions to not recuse himself from the Russian case. Then Trump blew his stack when Sessions (properly) recused himself anyway. With the Attorney General at that point under fire facing Trump’s wrath, Sessions tried to appease Trump by caving to the prez’s wishes to dig up whatever dirt he could find on Comey, so Trump could have reasons to fire Comey (which he subsequently did). It’s clear Trump tries to use the power of our justice & intelligence prowess much like Russian leaders have always relied on the KGB. Trump has even insisted he has the right to control these agencies, thinking he’s above the law. So Sessions is currently also in legal jeopardy & probably should be removed as Attorney General, but the risk there is Trump could install a puppet who might try to limit the scope or funding for Mueller’s investigation. Folks, be aware this is what a constitutional crisis in the making might look like. The biggest headline this week was the book. It has absolutely rocked the White House! Those who work there say Trump is like a child, very unfocused, moody, impulsive & in constant need of immediate gratification. He can also be manipulated through flattery. Trump chose to blame Bannon for being at fault in airing the dirty laundry disclosed in the book, but the author Wolff spent a lot of time on the couch in the West Wing & ultimately collected insights using 200 sources. It’s quite interesting the White House pushback comes in the form of broad generalities like the book is a work of fiction & they resort to attacking the author, rather than specifically rebutting the basic message of an unfit president presiding over an administration beset by chaos. Just check the numerous news reports below on what’s in the book, which granted Wolff no doubt embellished some parts to spur book sales, but the overriding circus-like/mentally-unstable theme doesn’t change & are verified by numerous reporters covering this White House. Some surrogates are practically making blood sacrifices to Trump by spinning ridiculous defenses on his behalf, as evidenced by Stephen Miller’s awkward/nervous meltdown today on CNN. But it’s a very good thing more Americans have been made aware & can be on the lookout for Trump’s crazy episodes when he goes off unhinged. Michael Wolff’s book “Fire and Fury: Inside the Trump White House” say that the spokesman, Mark Corallo, told Wolff in private that he feared that the Air Force One meeting represented obstruction of justice. The Washington Post reported last year that while aboard Air Force One on July 8 returning from the G-20 summit in Germany, Trump dictated a misleading statement about the meeting, in which his eldest son, Donald Trump Jr., and other campaign operatives met with a Russian lawyer. Trump Jr. said in his initial statement that they had primarily discussed child adoption programs, but emails he released days later showed he had agreed to the meeting after being promised “dirt” on Hillary Clinton, the 2016 Democratic presidential nominee. In their new book How Democracies Die, Harvard political scientists Steven Levitsky and Daniel Ziblatt flag this as a key threat to democratic stability. Institutions don’t typically collapse under sudden attack. Rather, “if a charismatic outsider emerges on the scene, gaining popularity as he challenges the old order, it is tempting for establishment politicians who feel their control is unraveling to try to co-opt him.” From Mussolini to Hugo Chávez, authoritarians end up winning because these “fateful alliances” end up leading establishment politicians to collaborate with the demagogue not just on their points of policy agreement but on the demagogue’s desire to dismantle critical institutions. 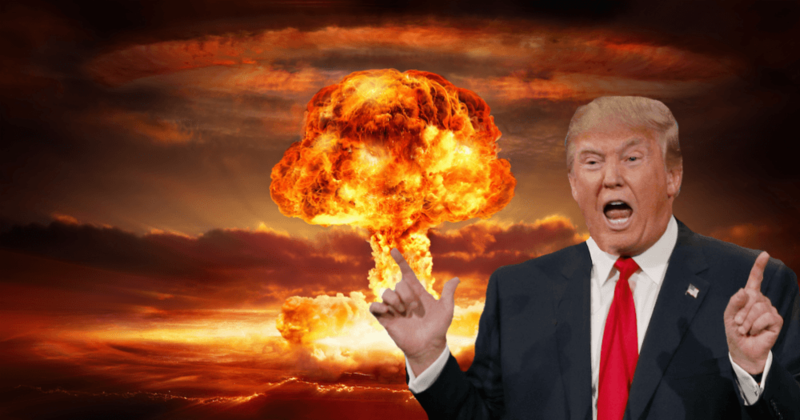 Wrapping up the last couple group of links, there are articles on the foreign dangers from enemy states & internal dangers from a president that is often seen as mentally unstable. We’re currently seeing unrest in Iran over leadership corruption & economic woes with an uncertain outcome. As much of a threat being posed by the North Korean nukes & Iran’s nuclear development, also keep an eye on this growing rift between Trump & Pakistan, with our prez shutting off financial aid. That whole situation should rightly have the world alarmed. Pakistan has an unstable government & a large population with various factions throughout the country, many of whom follow the more radical Islamic ideology. I would judge the overall mood of the Pakistani people to be more inclined towards jihadist Wahhabism than the general attitude in Iran, especially from Pakistan’s Sunni sect which Iran is more Shiite (but I’ll resist getting into the nuances between the two). And by the way…..Pakistan already does have nukes. In the meantime, there is little doubt about who Donald Trump is, the harm he has done already, and the greater harm he threatens. He is unfit to hold any public office, much less the highest in the land. This is not merely an orthodoxy of the opposition; his panicked courtiers have been leaking word of it from his first weeks in office. The President of the United States has become a leading security threat to the United States. I can’t deny the Kos is more like the leftwing’s answer to the far-right echo, but in going beyond the normal norms of journalism, they sure do produce some juicy stories on Trump. I’m certain about two things. Number one, there’s a lot in these articles that are exaggerated & probably not true. But secondly, some of this stuff is true! We can browse through it & try to speculate/separate what is fact from fiction.